Hey, Paul Wulff and WSU nation can now re-embrace one of our own. 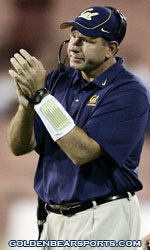 That’s right, Jim Michalczik, the recently hired UW offensive coordinator/offensive line coach, has now LEFT Montlake! KJR just broke the story. Michalczik is headed to work with Tom Cable as the offensive coordinator for the NFL’s Oakland Raiders. Congrats…..and welcome back to the Cougar family Jim! You are currently browsing the archives for the Jim Michalczik category.